Last week I recieved a cute little package in the post full of Star Gazer goodies. Originally, I’d only ever heard of the brands nail polishes so I was excited to recieve some different products. I recieved two eyeshadows, a blusher, a lip gloss and a nail polish. Apologies for the awful out of focus photos, I was in a rush as daylight was running out as well as my battery and I only realised as I ulpoaded these to my laptop! 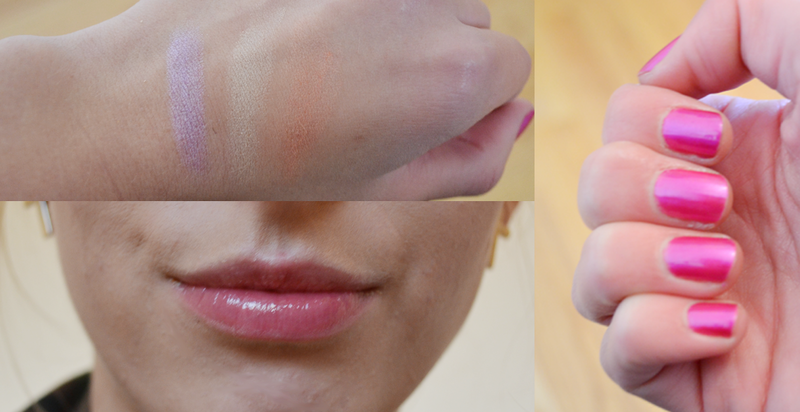 Also, the photo’s definitely don’t do justice for the eyeshadows and blusher especially. 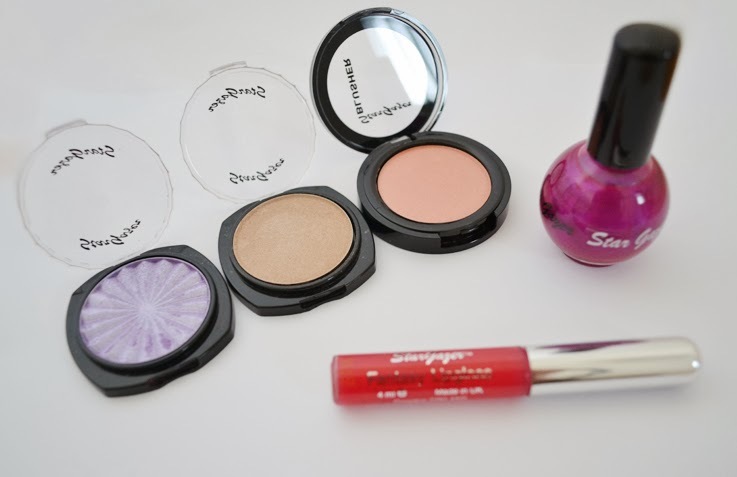 First up, the eyeshadows. I’m a big neutral-eye wearer so was a bit put off by Plush Purple at first. It’s an electric lilac with shimmer in it. Although it scared me at first, I was amazed by the pigmentation of this colour and can imagine it looking beautiful on a green eye. The second colour is Champagne and is a gorgeous subtle shimmer. It appears more brown in the pan however transfers onto the skin as a slightly more white shine. The pigmentation isn’t quite as strong as Plush Purple, but I can see it as being the perfect inner corner and brow bone highlight. Next is the blusher and in shade Blusher 5, it was the product I was most looking forward to. The colour is a beautiful peachy-coral which is my favourite kind of blusher to wear,. It’s a subtle but gorgeous colour, with again great pigmentation as well as a bit of shimmer to give off a healthy looking glow. I’m not a massive lip gloss wearere but after seeing TOWIE come back onto my TV screen I’ve decided I need to make more effort – do those girls ever not have any gloss on?! The lip gloss is in shade Natural and comes in a perfect handbag size tube. In the tube it looks like it has more of a pinky colour to it despite the Natural shade, however when on the lips it is super natural giving a gloss and sheer colour. I’m definitely going to be using this more often! Finally was the nail varnish. The shade is Nail Polish 106, a shiny purple colour in the pot, but as you can see it is a much more pinky colour on the nails. The picture shows my nails with 3 coats of the colour. I’d say 2 was more that enough – I just seem to always pack on lots of layers regardless of the opaque-ness! I adore this shade, however it did chip after two days but that was probably no fault but my own as I didn’t put a top coat on! !